I thought I’d do a bit of a round up of the projects I’m working on right now, and well as a bit of what I’ve just finished. My proudest recent achievement is definitely learning how to knit socks. I spent months doing nothing else. I’m doing a bit of simple embroidery too. This is actually a napkin that I found in Ikea’s ‘as is’ bin for $1.00. It has four lovely little motifs, I’ve done two so far, a teapot and two hares. I finished embroidering a very cute little lady. The variegated floss is hand-dyed by Bathtub Studios and I found it on Etsy. It’s a real pleasure to use. Her ruffled underskirt is done in Bayeux stitch and I am very happy with how it turned out! It’s not hard to remember my first project as it was only 5 years ago! A friend had given me an old, soft and beautiful English linen tea towel printed with William De Morgan’s peacock and fish. She knew that I love the Arts and Craft movement. Although I had never embroidered, something about the idea of glorifying and honouring the humble tea towel and the anonymous feminine work that it represents tickled my feminist fancy and I thought I would outline a few lines. Ha! I had never stitched but as a weaver-in-training (loom and tapestry) I was very comfortable experimenting with thread and yarn so I bought some DMC floss and a pack of needles and thought I would just doodle a bit. 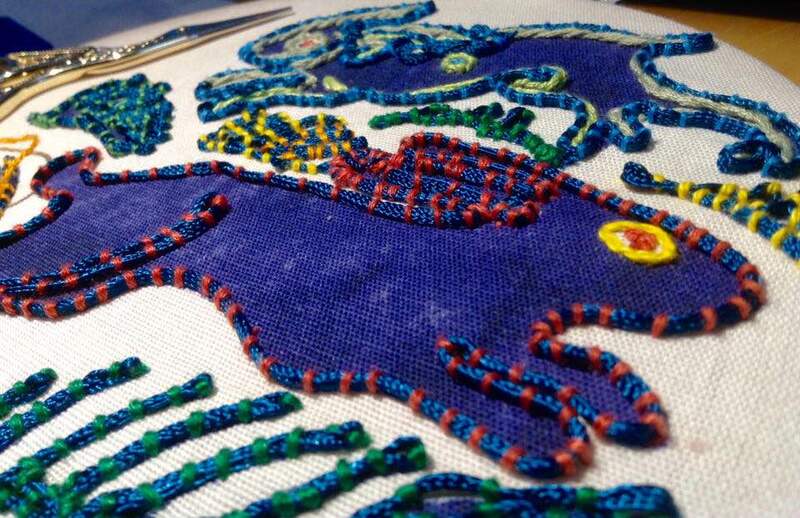 By the time I was done, around 250 hours later, it was heavy with thread. It turned out to be a vivid and naive piece that I am still very proud of. And I have been stitching ever since. These days I really enjoy learning, adapting, and practising different traditional styles of needlework, but I think that embroidery is, at it’s base, the most intuitive and natural of all the yarn and thread crafts. That first piece showed me that picking up a needle and thread, even with no knowledge of proper stitches, is enough to create a work of beauty. I wonder what your first project was? human tissue have been sick. to nip away the raveled ends. I’ve been doing a fair bit of mending for friends and family lately, and I am very honoured that they have trusted me with some pretty important textiles! I finally got a chance to try some very fine invisible mending. I thought I would describe the process for you. Invisible mending is a sophisticated weaving method consisting in rebuilding the fabric of a garment but also of upholstery after an accident: snag, burn, accidental blade or scissor cut, etc. Both the warp and weft of the fabric could have been damaged. Invisible mending is the reconstruction of both the warp and weft using a long needle. The mender (most often a woman until the craft started to vanish), picks all the necessary weft warn in the hem, and the warp yearn in the extra fabric on the inside of longitudinal seams. She will reconstruct the warp and weft to exactly match the original weave. After this is done and the garment has been pressed, the mended part will be undetectable on the outside of the fabric. However, on the reverse side, the restored area will be marked by the long hanging threads where the weaving was done. The hanging threads occur because invisible mending is done without tacking, as it could deform the fabric (unlike darning work). While mending in general is included in the industrial production process, invisible mending is a service that is still provided by high end dry cleaners. 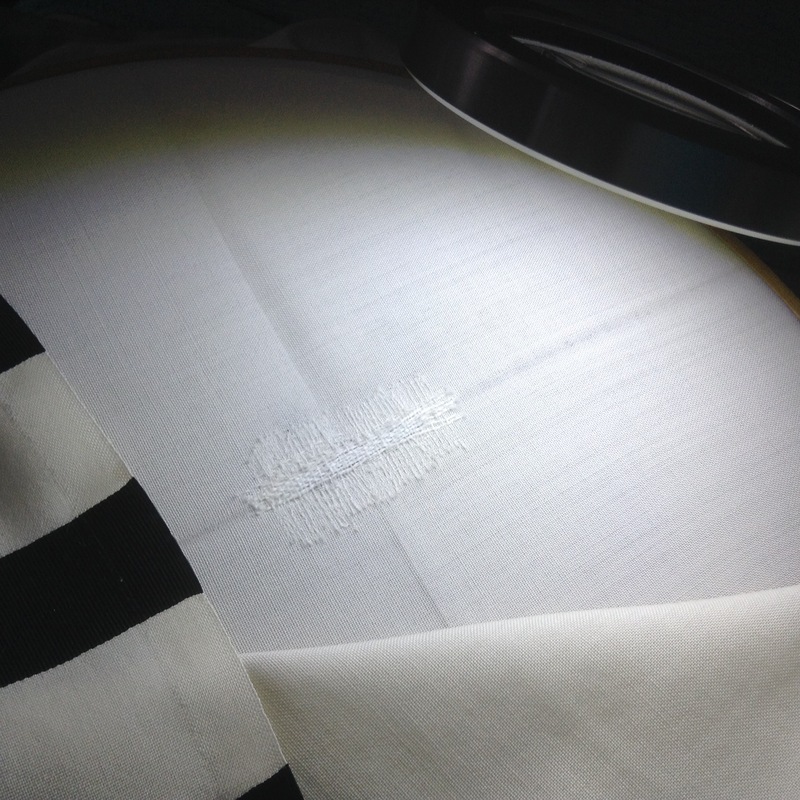 In addition, the results of invisible mending are invisible on both sides of the fabric. Up until the 70s, mending and invisible mending were common practice. 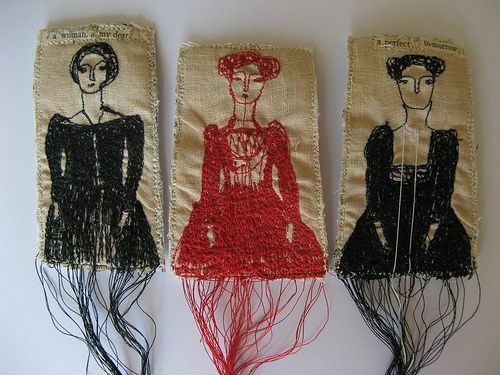 Nowadays, they have become fine crafts associated with tapestry weaving. Q1. 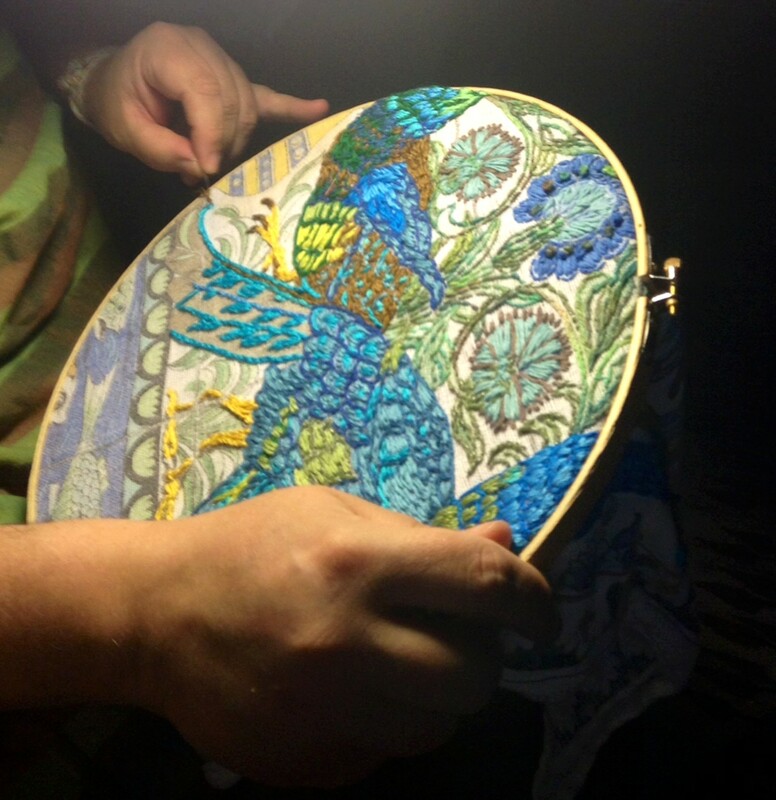 When did you learn needlework? A1. I came very late to the textile crafts. I was already in my mid 40s before I began and I am only 50 now. 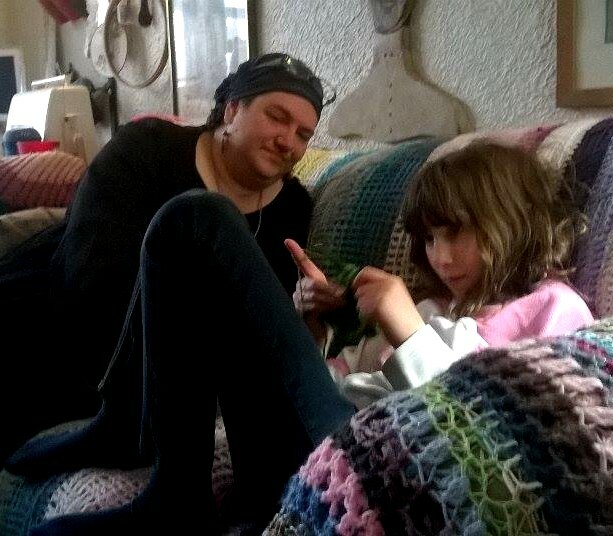 My grandmother had taught me a bit of crochet when I was 8 or so, but she had difficulty teaching a left-handed kid with learning disabilities that included directional confusion. It was frustrating for both of us. In grade 7 I took a class called crafts (very unwillingly). The teacher was old-fashioned and refused to let me knit ‘backwards’ aka left-handed. The two of us struggled over a 12″ teddy-bear made of horrid blue variegated acrylic for the whole semester, with her smacking my left hand with a knitting needle every time she found me knitting left-handed. To this day I don’t like to knit! Baba StringThings’s Round-Up of All Things String. Greetings my fellow String Sistren and Brethren, I have missed you all! This has been a really busy few weeks for me. I have been working on finishing a commissioned crochet peacock feather blanket, my depression lace is looking better and better, and I have bought a brand new lace weight Turkish spindle and some beautiful fibre. I seem to be spinning all of the time now. My teaching has been chugging along nicely. I have many new crocheters, lots of new kumihimo braiders, and a few people interested in trying embroidery for the first time. Exciting! Author Baba StringThingsPosted on October 21, 2016 Format GalleryCategories Baba's Life, crochet, Embroidery, Personal, Spinning, Textile Tools, Uncategorized2 Comments on Baba StringThings’s Round-Up of All Things String.